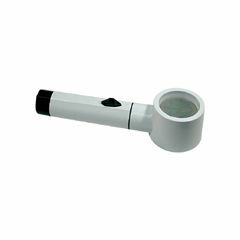 The lens on the Reizen Aspheric Stand Magnifier have been specially calculated to provide distortion free viewing with special blue-coating-index matched to improve light transmission. Simplicity of style with break-resistant frames. Bulb powered by batteries giving a high-brightness shadow for illumination performance. Uses 2 "C" batteries. Distortion at 7x makes you dizzy!! The diameter is too small for 7x mag, causing letters to overlap, distortion, dizziness. My mother tried to use it to read telephone numbers, check book, titles, etc. Could not use it. [...] One more medical rip-off! I won't do this again.